Olive Blossom is one of our most delicate plant based fragrances which follows closely natural bloom of Olive Tree. The flowers of blooming Olive Tree are so delicate that it is almost too easy to overlook them, yet they possess one of the most exquisite fragrances to delight and inspire anyone who comes close enough. This Odore Mio fragrance too will impress anyone who comes closer into your personal space, and it will remain discreet and almost invisible to everyone else. It will linger and surprise you every now and then giving you a hug when you need it. We also used Olive Tree bark extract to add sophistication and strength to the delicate blooms. 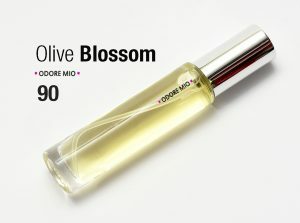 And the Olive Blossom itself is further enhanced with high notes of Jasmine flowers. Ambrette seed and high notes of sandalwood and Vanilla provide support at the base of this fragrance.